Black tattoo ink in tibetan design are best in class tattoos and much requested by our clients. Most of our clients like having a spine tattoo or an armband tattoo designed in a Tibetan script that they would be the only ones to understand. Wether men or women, they choose a Tibetan translation in order to keep the meaning confidential. They choose to whom the real signification of the ink shall be shared with. Choose your tattooist carefully ! if you found a free Tibetan tattoo or get it realized for a cheap price, we can also proofread it so that you be sure that there is no error into it. 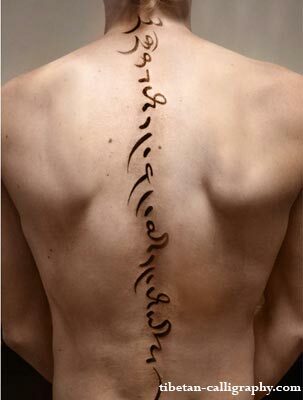 Black ink tattoo can be done in several forms in Tibetan script : vertical, horizontal and rounded tattoos. Furthermore that can be realized in several shapes to ink ideas coming from your own words or from quotes. You can even get tattoo sleeve by mixing Tibetan calligraphy and Tibetan symbols or designs.